Last Saturday I left the Knox-St. Norbert football game to watch the one hundred and fiftieth anniversary remembrance of the Lincoln Douglas debate. Oddly, scheduled to start at 2pm or about the beginning of the second quarter at Old Main on the Knox campus. 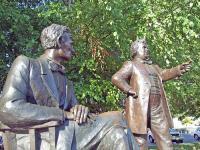 The actors portraying Lincoln and Douglas are very good. You still have a limited time to catch this tour. College football hadn't taken off in 1858, but was soon to appear. Several of the 10,000 who attended the debate in 1858 could have returned to watch the first Knox-Monmouth game thirty years later. I suppose a different game could have developed over the last 120 years, but the game of football as it is played today is America's most exciting sport. What would Lincoln have thought? Actually, Lincoln may have been a good football player: tall, strong, and known for wrestling matches in his youth. I could see A. Lincoln as a tight end or defensive end; I wonder what his 40 time was? Stephen Douglas at 5' 4" and 90 pounds known for great rhetorical skills may have found a role as a PA announcer. Even though, the 1858 gathering would soon be engulfed in a great civil war, after it's end colleges began to battle on football fields. 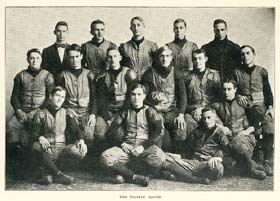 College football became very popular in the second half of the 19th Century; the Knox vs. Monmouth "Turkey Bowl" started in 1888. It is college football's sixth longest running rivalry and Illinois' oldest college rivalry. 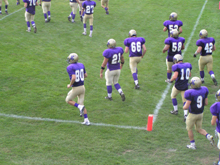 The first Illinois high school game according to IHSA was Hyde Park against Englewood in 1889. It is football that can ignite school spirit and cause a community to become awash in the home colors and warning signs that you are entering "LionTigerBear, oh my" country. Every sport requires dedication none more than another fall sport, cross country. Unless you have a direct relative in cross country I doubt you are going to a cross country meet this fall. Football is an unpredictable game that keeps fans hoping for a turnover, breakaway run, or kick-off return. I and millions of other Americans love to watch a good football game. What makes the players love the game, they have to sacrifice a lot more than we mere fans? Football is not just a few guys picked up to fill out a team in today's world. High school players work toward fall and certainly college players train all year. No one on the 1888 teams had spent time in the weight room. Players today work hard, even in high school. Many good players may never be on a team after high school. The opportunity to play high school football is open to nearly every student in the WPT. You can be a good player, by working hard, having a little skill, and a good attitude. The larger schools require more skill or you will be cut, but in the WPT no one is turned away. If I were a high school coach I'd rather have 36 good players than 6 stars. Assembling a team of 36 sophomores through seniors who work hard all year and put the team first is not easy, but it will make a program a success. Sometimes a coach needs to know less about football than the psychology of teenagers. It is hard to understand the dedication that some players give the game considering the type of reinforcement they appear to get from the coaches. I expect coaches to be demanding and fair, but a few too many jerks spill into the ranks. Even if the coach is something of a jerk the four short years of high school are a once in a lifetime opportunity to become part of something very special, a team. No one is a team, so it isn't something you can achieve on your own. A team happens when everyone contributes, even those who have a few weaknesses. It is the time and dedication so many kids are willing to give to be a part of the team that makes you respect them. The teams that are not winning, but still have players working hard on every play deserve enormous respect. We all cheer winners, and it is great to be part of a good program. Not every player is dedicated, but a losing team still has many dedicated players. I hope fans will remember that before they express their opinions. The kids on the o line, the work horses, who no one knows unless they screw up are always a great bunch. I suppose it is easy to understand why a stand out player is on the team; it is his way to excel at his skill and gain status. Still, I do understand why someone who will never be a stand out player will work everyday. It is because it is so great to come on the field as a team, to contribute with the great block or saving tackle. Just as the fans hope for a big play even as their team's prospects grow dim, a player still hopes for an opportunity to make a good play. Sometimes a year of work can be worth that one moment. I suppose I should mention the St. Norbert-Knox game as I close. St. Norbert has won the Midwest Conference nine of the last ten years, so no one expected the Prairie Fire to win this one. Knox even led the game for a while but ended losing 63 to 24. No one at Knox is on campus to just play football; of the over 1600 who applied last year less than 300 became Knox freshman. It doesn't mean that Knox players don't train hard, they do, and some are real standout athletes, but they do not have the numbers that other programs have out. I still respect the players, I still cheer them, I still hope for a win, I still believe that this year the "Turkey" will return to Knox. Well, if not this year, maybe the next.